A move from South Birmingham to Stafford with my parents provided me with greater access to railways than I had hitherto enjoyed. The West Coast mainline a few miles south of Stafford was now within a couple of minutes from where I lived and I could hear the trains as I lay in bed. Even better was Stafford station was a short bus wide away where even more trains could be seen. September 1960 and I moved up to secondary school from where I was in earshot of the trains. In fact in some classrooms you could watch the trains on the mainline and also see the Jinties shunting the yards south of the station which could be visited each lunchtime! 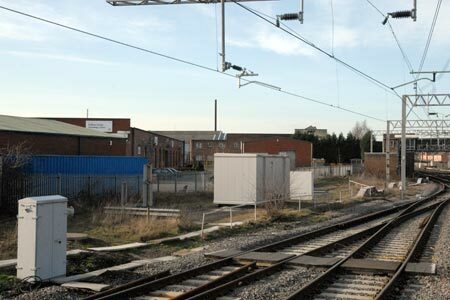 Photo - The remains of Stafford steam shed (5C) from the north end of platform 6 in 2011. The site is now used by the local college and the original 4 road shed, which saw some major modifications, is still in use today. Long gone are the coaling tower, tracks and turntable are long since gone. Sadly I can remember standing here and seeing a dozen or so locos in steam. At the time Stafford was a wonderful railway junction with virtually 100% steam operation. There were a few diesel units creeping in and diesels were starting to make some headway. These included 10000 and 10001, 10201 to 10203 and the first examples of EE type 4's (later class 40) and EE type 1's (later class 20). Apart from these everything else was steam. What a show it was! From the magnificent Princess and Coronation Pacifics through Scots, baby Scots and Jubilees to the Black Fives, Stanier 8Fs, Jintes, Stanier 2-6-0s, Fowler 4Fs, LNWR 'Duck 8s' to Fowler 2-6-4Ts, 'Flying Pigs' plus some of the relatively new standards and even some LMS 4-4-0s! At secondary school I spent most lunch times on the station during which time you could see what was on shed (5C) from the northern end of the platforms. Sometimes there would be ex-works locos from Crewe Works in the shed yard often from parts of the system that were not regularly seen at Stafford. These were great cops and quickly underlined in the relevant ABC. Sadly the 4-4-0's soon entered storage and were joined by a couple of the 0-8-0s. These locos languished behind the shed and were eventually dragged away for scrap.